A space that truly reflects the ingenuity of Mac Stopa and the rest of the Massive Design team, their Warsaw office is wildly imaginative with bespoke finishes throughout leaving a beholder with the ultimate "wow" effect. Massive Design has tested their firm’s creativity on the design of their new offices located in Warsaw, Poland. The Massive Design team, led by chief architect and designer Mac Stopa, recently completely the design of its new office located in downtown Warsaw. Creativity, functionality and innovation were the main criteria driving the design process, the success of which was achieved using a variety of innovative design solutions, including fixtures, finishes and furniture. Most of the solutions were custom-designed by Mac Stopa and his team or designed by Mac Stopa for serial production for manufacturers including Cappellini, Tonon, Nowy Styl Group, Profim, Milliken, Laminam and AS Creation. The space is divided into zones: reception/visitor area, social zones and office area. 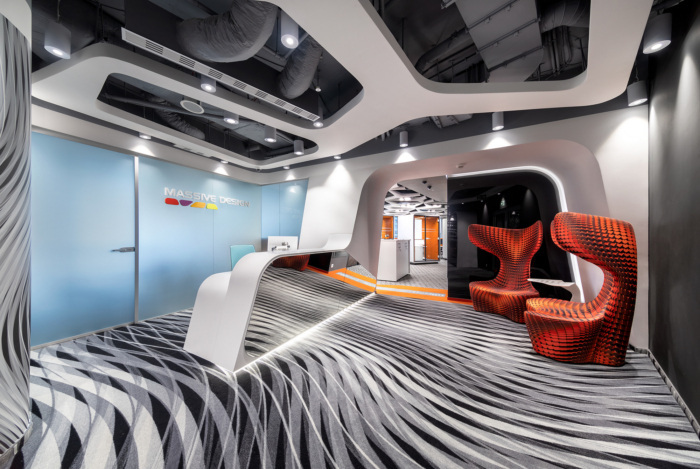 Throughout the office, creativity is expressed through a myriad of artistic expressions conveyed in the custom organic ceilings, bespoke carpet, 3D graphics on walls, glass panels and doors, in-house 3D printed door handles and sculptural-shaped furniture, all of which create a “wow” effect. In the reception, the custom-designed mirrored front desk in Corian® extending from the arch of the reception wall and Drum armchairs for Cappellini intensify the three-dimensional effect. The fit-out of the conference room with custom table made from Star Maker quartz tiles for Laminam, Pelikan armchairs for Profim, Harmony in Motion wallcovering for AS Creation and a lacquered wall of built-in cabinets housing the samples library, adds bursts of color and energy. Creativity permeates the entire space thanks to the eclectic mix of design solutions and products, several of which have received top design awards. In the social zone with kitchenette, colorful Swirl graphics on Flotex flooring by Forbo warm up the space. The social zone also functions as an informal meeting room. Modular Tauko tables and chairs for Nowy Styl allow for multiple configurations. A presentation wall projects images on a flat screen monitor against a background of organic forms in which Massive Design projects are displayed. The office area is designed using flexible open plan solutions supporting activity-based working. As it is critical for the architects and designers to communicate efficiently and rearrange project teams depending on need, staff are equipped with flexible office solutions, such as raised floor, desks with height regulation, and phone booths and conference booths for quiet work or brainstorming. The booths can be easily rearranged as required. Custom designed free-standing island cabinets also function as collaborative work space. Transparency modular carpet for Milliken provides excellent sound absorption in open space. The sculptural shape of the organic ceiling resembles the Transparency pattern in the flooring. All millwork is built-in. Adjacent to the office area is the Club room. With black tinted glass on the outside partition and acoustically isolated from the rest of the office, the Club is designed for relaxation or brainstorming. In addition to several electric guitars and Tonon’s soft-touch River Stone poufs, the Club is furnished with Nowy Styl Group’s LinkUP armchair and chaise longue for enhanced relaxation. Tauko stools and conference table with height adjustment encourage informal meetings.